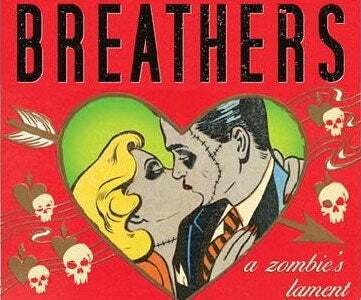 I wasn't sure if there was room for any more works in the burgeoning "zombie comedy" genre, but S.G. Browne's new "zom-rom-com" Breathers: A Zombie Lament turns out to be a pretty worthy addition. Spoilers! With Breathers, Browne stakes out his own radically different take on the zombie mythos, which may annoy purists but opens up a whole range of story possibilities. In Browne's world, zombies have been around for at least 100 years, and everybody knows about them. But zombie-ism is not contagious or transmitted via zombie bites, and not everybody who dies becomes a zombie. Only a tiny minority of dead people reanimate, and it appears to be totally random who reanimates and who doesn't. And the undead are able to keep all of the faculties they have when they were alive, even as their bodies tend to decay slowly unless they take in large amounts of formaldehyde. The whole thing, in its early passages, reminds me of the short-lived but awesome comic A. Bizarro, told from the point of view of a bizarro duplicate of a random guy. Andy still feels like the same person, but he's been transformed in both his body and somewhat in his faculties, and nobody will accept him. It doesn't help that his vocal cords were crushed in the accident, and so he can't talk except by use of a dry-erase board around his neck. His parents have saved him from being used for medical experiments or being turned into a crash-test dummy, and they let him live in their basement, but Andy's dad refuses to acknowledge him or treat him like a human being. On rare occasions, someone actually reanimates during their funeral. Which is what happened with Jerry. A friend of his videotaped the whole thing and sold it to America's Funniest Zombie Videos. Jerry taped the episode and brought a copy of the video to one of the meetings so everyone could watch. It was a typical funeral. The father standing up at the podium, speaking with conviction through his choked emotion. The sound of people crying. The casket, surrounded by photographs, closed and draped in flowrs. Then one of the arrangements slides off the casket as the lid slowly opens and you hear people gasping and screaming as chairs are turned over and horrified faces blur past the camera and the father stumbles back from the podium and shouts, "Dear God!" Then Jerry sits up in the coffin, pulls the eyecaps and cotton out from beneath his eyelids, and glances around the room, his eyes blinking. The camera moves in closer, a full frame shot of Jerry with his cheeks raw and his head wrapped in gauze as his father wails off camera. Jerry blinks and shakes his head, looks once more around the room and down at his casket, then turns and stares straight into the lens and says, "Dude, is that my video camera?" If you can buy into the idea of an alternate world where America's Funniest Zombie Videos is a popular program, then you end up just running with the zany weirdness. So Andy, the hapless zombie main character, winds up falling in love with one of the other zombies in his support group, a suicide named Rita, who's sort of gothy and exciting. (Hence the "romantic comedy" part of it.) We get to see a zombie courtship, which involves a lot of grunting and hapless fantasizing, and it's sort of sad and depressing in its caricature of a regular human courtship. The novel really takes off about halfway through, when a few things change. Without giving too much away, Andy and his friends meet a zombie named Ray, who seems to have a more independent, empowered approach to life. Ray starts feeding Andy and the others his special venison, which he keeps in jars and which tastes way better than any other food to their dulled zombie tastebuds. Andy and the gang start feeling invigorated and full of something approaching life once again, just as they also start to suspect that maybe that venison isn't really venison. In the second half, it becomes much more of a standard zombie rampage story, and is much better for it. Our characters stop pretending to be human or trying to live according to human double standards, and meanwhile, Browne's off-kilter social satire gets cranked up several levels higher as Andy starts going on Larry King Live to promote zombie rights. The undead's existence turns out to have a whole bunch of possibilities that Andy never knew about, but paradoxically the very thing that makes him acceptable to living humans is also their biggest taboo. Bottom line: It's a very zany Chris Moore-esque romp, which doesn't try too hard to make sense, or take itself too seriously. It gets more demented and crazy in the second half, when both the characters and the author let go of any last shreds of sensibility. It's at its strongest when it plunges into gruesome farce, with a healthy helping of undead slapstick.